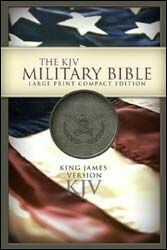 The KJV Military Bible combines the full text of the beloved King James Version with ancillary content to inspire the men and women who serve in the American Armed Forces. The Bible might be called a library of freedom - not just temporal freedom but enduring freedom in the truest sense of that expression. Horace Greeley, founding editor of the "New York Tribune," said "it is impossible to mentally or socially enslave a Bible-reading people." For these perilous times, for the men and women who serve the cause of freedom around the world, Holman Bible Publishers is pleased to provide the "KJV Military Bible "in the large print compact format that is handsome, easy to carry, and designed to meet the specific needs of those who serve in the most difficult of situations.Special features include the full text of the beloved King James Version, lyrics to patriotic songs and battle-themed hymns, transcribed prayers from past and present American military and political leaders, and more.